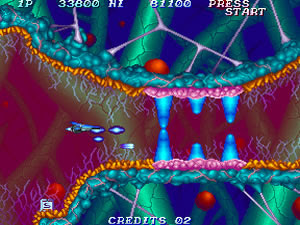 Konami could’ve been objective and lazy, launching Salamander 2 as a stand-alone disc for the console market just a few months after the game had debuted in the arcade scene. It’s really fortunate that the company was still on top of their game during the 90s (unlike what sadly happens today), so we were blessed enough to receive the game bundled with predecessors Salamander and Life Force, shooters that were by then almost 10 years old. Titled Salamander Deluxe Pack Plus, the compilation came out for the Saturn and the Playstation and is a real gem both for lovers of the Gradius universe and non-Gradius fans alike. After all, Salamander games have no checkpoints, which were always the bane of any Gradius game except for anything post Gradius IV. In almost all aspects Salamander 2 represents a remarkable leap over Salamander. Prettier, smoother, more intense and definitely more fun, the sequel takes what made the first one an exquisite hybrid shooter and applies a nice overhaul to everything. The organic environments still set the tone, but the presence of flaming suns, large battleships and meteor-filled outer space bases amplifies the scope considerably. It’s still a short ride given the six stages available, but that’s duly forgiven once the player is granted access to the second loop and the challenge receives a considerable boost with suicide bullets on the side. It’s nothing close to what you get, for example, in the second loop of Xexex, in fact it’s probably one of the most manageable second loops with suicide bullets I’ve ever seen. Coming to terms with the basic gameplay in Salamander 2 shouldn’t be any surprise for those who already know the first chapter. The good thing for newcomers is that the sequel ditches symbols for most of the items and adopts alphabet characters, thus making the learning process a tad easier. S stands for speed-up and M for missile. 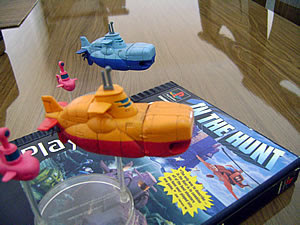 The main weapons are L (laser), R (ripple laser) and T (twin blade). The only two items with symbols are fortunately self-explanatory: force field and option. As we all know, in the Gradius universe the option is that omnipresent energy sphere that follows the spaceship around and mimics its primary weapons. They now come in two sizes, with the smaller one called “option seed”. A single option seed creates a small option that circles the ship while shooting the default bullet sprite at a fixed firing rate. If a second option seed is taken a full-size option is added to the ship’s arsenal, to a maximum of four. What lies beyond the basics is what takes this game a step further in terms of dynamic gameplay. Taking a weapon item of the same type, for instance, boosts its power for 10 seconds. A second missile power-up will make the ship fire missiles in both directions (up and down) but with their crawling ability revoked - these two missile modes are switched by taking further missile items. And then there’s the final improvement, a separate button used to sacrifice your options: push to turn one option into a homing laser, push and hold to unleash more options at the same time. The sacrificed options will come back to the ship as option seeds, so for every option you kill you still get half an option back. It’s a great resource to take care of enemies behind walls or to relieve the tension if you’re about to get overwhelmed. There are two score-based extends at 200.000 and 500.000 points. Basic scoring involves taking every possible power-up icon (all of them are worth 300 points each), playing as a killing machine, milking bosses for popcorn when feasible and triggering two mildly tricky secrets worth 100.000 points each. Apparently invincible, the Golem brain of the first stage can be destroyed if you reach him with at least one weapon (L, T or R), two full options and missiles. The problem is that to achieve this firepower level so soon in the game you need to kill the popcorn enemies in a predetermined order. It’s not that hard to do but a little practice is definitely needed. A second trick for another 100.000 points is in the start of the 4th stage: destroy the two spaceships without hitting the rings in their thrusters (hit their right halves only) and a third ship will appear from the left, then waste its three sections from top to bottom to get the bonus score. This second trick is easier to perform than the Golem’s kill. Salamander 2 has it all in the way of eye candy, with very little slowdown (only present in a few sections of the 5th stage) and an overall easier difficulty. There are no walls of any kind, especially fun-breaking parts such as the 4th boss in the first chapter. Another reason for the more friendly challenge is the fact that rank takes longer to kick in and gets totally reset upon death. Options will linger on screen until you take them back, therefore with the exception of the lack of speed-ups the game is still quite manageable once you die. It also flows in a more cohesive manner thanks to the almost complete elimination of empty space (one of the minor downsides of Salamander), with an asymmetrical distribution of horizontal to vertical areas. 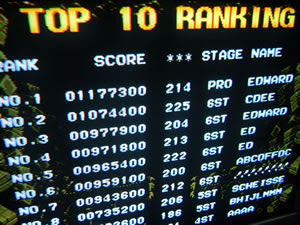 The only vertical stages are levels 2 and 6. I like how wall turrets are absent in vertical stages, they always sounded a bit weird in the first game. Although this sequel undeniably surpasses Salamander, it does lack an aspect that helped pave the first game’s fame: the announcer and his cheesy voice messages. The only voices you’ll ever hear appear when items are taken and during the fight against the last boss. The music in Salamander 2, on the other hand, is nothing short of outstanding, with great themes from start to finish. The song for stage 2 is one of my favorites of all time, and stage 4 somehow reminds me of the epicness of Radiant Silvergun. Old fans will cheer and rejoice when they reach the second loop, for the music is changed to a remixed version of the soundtrack for Salamander. That was a nice one, Konami. 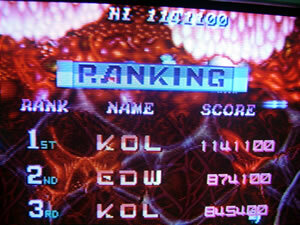 I spent approximately one week playing Salamander 2 as part of the STGT 2012 on the Shmups Forums. After looping with Vic Viper (player 1) I switched to Super Cobra (player 2) because the game gets slightly easier with this second ship (beating it once unlocks an option to start the game directly on the second loop). I played on NORMAL (MEDIUM), and in my best run I reached stage 2-5. Ever since I played Seaquest in my Atari 2600 clone way back in the past (I was there, I lived the good old days) submarines were always in a special realm of fantasy within shooting games. There weren't so many of its kind, maybe that's why In the Hunt stands out as the most recognizable one. It's a sprite-based behemoth that looks a lot like a Neo Geo game, partly due to the graphical similarity with famous run'n'gun series Metal Slug, whose first chapter would be developed a few years later by the same team who took care of this game. In the Hunt (Kaitei Daisensou in Japanese) is a special shmup because it has a considerably slower pace than usual. Pacing is actually my only gripe with the game, I wish it ran at least a little faster (I also had the impression that the Playstation port seems to run just a tiny bit slower than the MAME rom). In the Hunt also ditches automatic scrolling: the screen will only advance if the player wants, allowing everybody to establish their own pace provided the timer doesn’t reach zero. When this happens all lives are lost one after the other, there’s no way to bypass that. The clock runs more slowly than regular time and gets refilled at certain spots in the stage, but that red timeout is dreadful… Be careful not to run out of time when procrastinating, milking or waiting for the best window to navigate through tougher areas such as the fields of spinning missiles. As the commander of the submarine you’re given permission to unleash justice across six stages of underwater hazards. The mood is initially set by a couple of blue whales passing by as the submarine gets propelled into action, armed with torpedoes and bombs. Torpedoes are fired in a straight line, bombs drop explosive rounds while firing missiles upwards. These missiles change according to the submersion level of the submarine: if you’re underwater they just travel upwards and fulfill their purpose at surface level; if you’re at surface level they are projected into the air with different results. In order to change the weapon types you need to destroy carriers and pick up items. Torpedoes can be red (naked projectiles - default), blue (shockwave) or green (cluster explosions). Bombs can be the default (gone once any of the others is taken), type A (floating mines/machine gun) or type M (missiles/homing missiles). There’s still one item left, the star icon. It might be inside floating blue shells or appear when certain enemies are destroyed, varying in size. The smaller ones are worth 1 star, larger ones are worth 5 stars. The player earns an extra life when 100 stars are collected. Unfortunately the stars serve no other purpose (the number that appears below the stars is the number of continues left). In the arcade mode there are no other resources, but the Playstation arrange version adds a shield to the item roster (yellow item). This arrange version is pretty much the same game, only made easier by the shield itself. The bonus at the end of the level seems to relate to the number of enemy subs destroyed and the boss kill. Losing lives can lead to tight situations depending on where you die. Once this happens it can be a good strategy to just move forward against the enemies to take advantage of the generous invincibility window. When a game has such a multitude of explosions and different environments it’s easy to get involved in the action and enjoy its natural flow. That’s the reason why In the Hunt is bearable despite its sluggishness. Main stage motifs appear as the South Pole, infiltration into a harbor channel, ascension through ruins with a huge stone boss on the submarine’s tail, a sunken town, caves with melted lava and a final fortress where the ultimate enemy torpedo awaits. The order of the stages is different from the arcade game, but I kinda like the fact that you get "Seabed Ruins" as third stage. Enemies range from the basic stationary mines to freezing lasers, walking/swimming robots, enemy subs, intelligent turrets, tanks, trains, planes, floating bombers, helicopters and all sorts of aquatic machinery. They all provide for an intense campaign considering the game's slow pacing. Enemy bullets are also on the slow side most of the time, and all bosses have fixed attack patterns that facilitate the progress credit after credit. My nemesis is the pair of turtle-like creatures at the end of the sunken city. As for the stone monster, to destroy it you need to bomb the overhead walls, dropping them over his head. Destroy their system before it's too late! All weapons have their proper use, but my favorite combination is the cluster torpedo (green) and the type A bomb/missile. Dealing with icons is an exercise in patience, since they take a long time to cycle colors/letters and force you to just sit there waiting. Once maxed out in power (3 items), every extra item adds one star to the star counter. The soundtrack for In the Hunt is engulfed all the time by the plethora of sound effects for bullets and explosions. It’s one of those games where you need to stop shooting to listen to it, except for boss fights. It’s not that great a loss because the music isn’t memorable by any stretch of the imagination. Playstation owners are better off using the improved arranged soundtrack - it can be heard in both game modes, Playstation and Arcade. Maybe to preserve the original arcade resolution, the vertical span of the screen in the Playstation port must/can be adjusted with L1/R1. It’s possible to hide the HUD entirely, but in some cases this isn’t beneficial. If you do this during the battle against the stone boss, for instance, you won’t be able to see his arms protrude before attacking from below. Despite the minor annoyances the Playstation package fulfills its purpose with co-op action, high score saving and optional autofire. My approach to the game was pretty straightforward, aiming for a quick clear. There are a few hidden ways to amass more points from key areas (e.g. bosses), but I’ll leave that to a future opportunity with the Saturn port. For now I’m satisfied with the result below, achieved on NORMAL (North American longbox release). Note: the starting number of lives is 4, so in order to match the arcade specs I had to go to the Options screen and set it to 3.